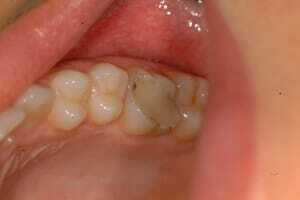 I wrote earlier today about white fillings. They are supposed to restore the natural beauty and strength of a damaged tooth. But all too often they are neither beautiful nor strong….. 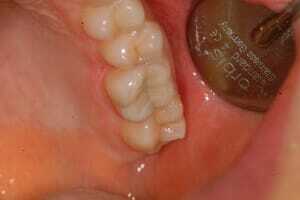 The problem is: amalgam fillings (the grey metal ones) are a doddle to fit. They are technique-insensitive. Because they are so forgiving, they tend to last a long time regardless of the skill of the operator (within reason). In contrast, every step in the process of providing white fillings (from buying the right material through to polishing and finishing) is way more complex than it is for a comparable amalgam. If you roll up a ball of cheap white filling material and squash it into a roughly prepped hole in the tooth: appointment time: 10 mins. Cost: £50. The patient is ‘happy’ – they got a ‘cosmetic’ filling in 10 minutes for £50…..(the same patient is not so happy when that filling fails 2 years later and they then have to shell out £500 for a crown!). Look at the picture of the old filling above (we removed it from a new patient): note how it is getting brown around the edges. Decay carries on merrily under the filling but nobody notices because it usually happens underneath. The result is root canal treatment if it is caught early, but extraction if not. So here’s a picture of the Winning Smiles replacement white filling. Hard to spot the joins? Producing natural looking, strong white fillings that last for more than 10 years does take more than 10 mins and costs more than £50. However that 10 minute white filling could cost a patient the whole tooth! No really. I thought it was a joke at first. Just the other day I had a gentleman turn up at my surgery for the first time with one of his front teeth missing. When I asked the obvious ‘what’s happened’ he said that his own dentist extracted the tooth but forgot/didn’t bother to replace it with a temporary tooth at the extraction appointment! they walk out with a tooth in place where there was none before. I find it utterly amazing that in the developed world in 2008 someone can walk into a dental office with a tooth (albeit a wobbly one) in place – and walk out with no tooth at all!! Suffice to say, despite there being no time in hand to sort this problem out – we had a ‘working’ lunch – we had a new tooth built from scratch and glued into place in less than an hour. Once the gum has healed where the tooth was extracted we will be putting an dental implant tooth in as a permanent solution. Had the patient come to Winning Smiles, it may well have been possible to put the implant tooth in at the same time as the extraction. Unfortunately a few days late is too late, as the gum grows down into the socket making immediate implant placement impossible.